Conflict and change are ideas that have driven Fleetwood Mac since their earliest days. While the band, who has sold in excess of 100 million records, certainly experienced their greatest commercial success following the addition of members Lindsey Buckingham and Stevie Nicks in 1975, the group itself actually formed in the late 60s as a British blues quartet which would bear virtually no resemblance to the group that churned out pop hits like "Little Lies" during the 80s en route to enshrinement in the Rock and Roll Hall of Fame. Beginning in 1967, the group featured founder Peter Green on guitar, Mick Fleetwood on drums, Jeremy Spencer on guitar and John McVie on bass. Over the course of the next seven years, artists like Christine McVie, Danny Kirwan, Bob Welch and Bob Weston would come and go as Green and Spencer departed. 1975 began with the addition of Buckingham and Nicks, then an off and on item, and Lindsey would take his first sabbatical in 1987. Christine and John McVie married and divorced and Christine left the band multiple times, rejoining most recently in 2014. All of which is to say that maybe it shouldn't have come as quite the shock it did when Lindsey Buckingham, amidst much acrimony, departed Fleetwood Mac again earlier this year. While that departure has riled up fans looking to place blame, what matters as the band embarks upon a North American tour is that Mick Fleetwood made perfect picks to replace him. As Tom Petty's erstwhile sideman through projects like Mudcrutch and The Heartbreakers since 1971, Mike Campbell became one of rock's most underrated guitar players. Always able to make a song better, Campbell rarely looks to steal the spotlight with a flashy solo (though, as he showed on stage last night in Chicago, he's more than capable of doing that too). New Zealand born singer and songwriter Neil Finn fronted rockers Split Enz in the late 70s and early 80s before moving on to even greater success as the voice of new wave rockers Crowded House in 1985. "Welcome, Chicago!" said Stevie Nicks to open the show. "Here we are for our second show in one of my very favorite cities!" 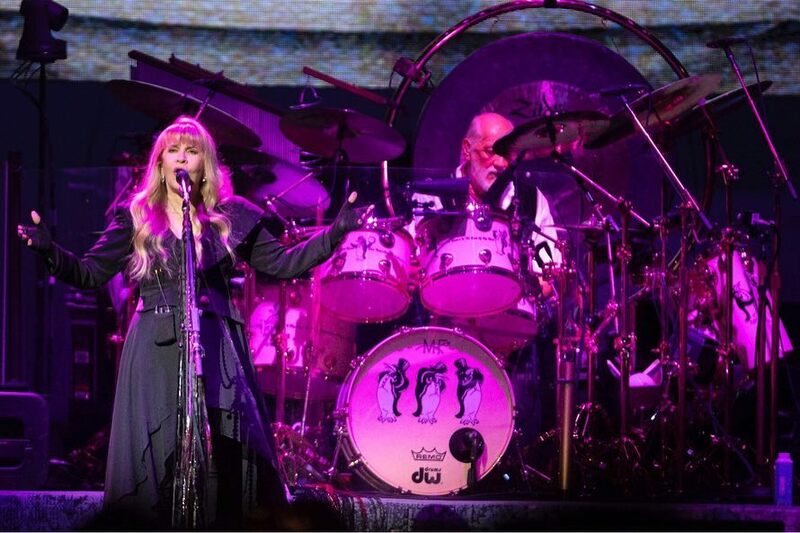 Fleetwood Mac performed as a twelve-piece act Saturday night in Chicago with Mick Fleetwood, John and Christine McVie, Stevie Nicks, Mike Campbell and Neil Finn augmented by additional guitar and keyboard players, a second percussionist and three background vocalists. 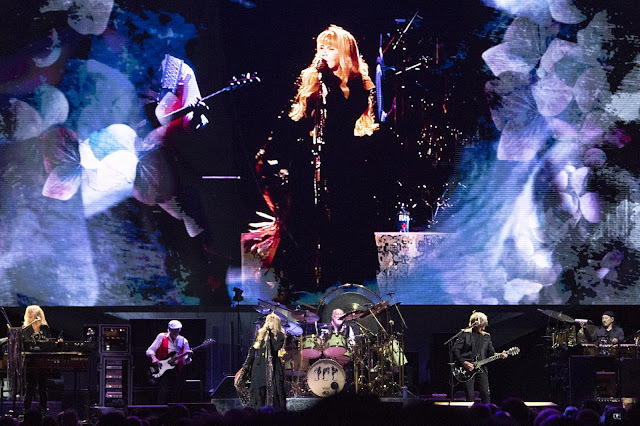 The group's stage on this tour is very simple, free of the technological trappings that accompany most arena rock shows, with the group performing in front of a single video screen. From their 1977 classic Rumours, "The Chain" opened Saturday night's show. As has generally been the case on recent Fleetwood Mac tours, their biggest album received the most focus, with seven tracks from it in the setlist so far on this tour. That performance put the spotlight on Neil Finn early, who nailed his solo on the track. He'd go on to provide stellar vocals and guitar throughout the evening. Finn is the flashier of the new additions. Now the youngest member of Fleetwood Mac at 60, he spun and bounced across the stage throughout the show. Mike Campbell, on the other hand, seemed perfectly content to hide in the shadows despite the stature and quality of his lead guitar playing. "Many, many years ago I heard this song and it opened a lot of doors in my own heart," said Mick Fleetwood, introducing an acoustic cover of Crowded House's biggest hit "Don't Dream It's Over." "It's unbelievably fitting," he continued referencing Finn's new place in the band as Stevie Nicks joined him on vocals, singing one verse of the 1986 hit. The group went out of its way to introduce their new members, putting a Fleetwood Mac spin on "I Got You" by Split Enz early and the Tom Petty classic "Free Fallin" later. Nicks once again took on the vocal of her longtime friend and collaborator and Campbell's familiar strumming of the Rickenbacker on it was a comforting reminder of his past. "During this set, we're going to pay respect to our history," said Nicks Saturday on stage at Chicago's United Center. "We have reached back in the history of Fleetwood Mac which is really exciting because it's a whole different thing," she continued, referencing the group's often overlooked roots in the U.K. blues tradition. Aside from the absence of Lindsey Buckingham, the most stunning part of the current tour is the desire the group has to dig into their vast catalog for tracks that predate the involvement of Nicks and even Christine McVie. "Listen, I'm personally really happy to be here with this band," said Campbell. "This song is written by Peter Green. Hopefully you know who he is by now," he continued, eyes locked on Fleetwood, both smiling, as a stripped down Fleetwood Mac consisting of just six players took on, arguably, the group's biggest early hit in "Oh Well." Nicks and McVie left the stage and blues guitar drove the gritty jam as Campbell delivered not just rollicking lead licks but lead vocals too on iconic lines like, "I can't help about the shape I'm in / Can't sing, I ain't pretty and my legs are thin / But don't ask me what I think of you / I might not give the answer that you want me to." Tracks like "Tell Me All the Things You Do" and "Hypnotized" were performed Saturday night in Chicago for just the second time since 1977. And what's incredible is the group's ability to balance those deeper dives by following them up with more pop leaning Fleetwood Mac hits like "Everywhere, "Rhinannon" or "Dreams" and making all of it work. Nicks took the lead vocal on "Black Magic Woman," a song made popular by Carlos Santana in 1970, though it was penned by Peter Green and released by a very different Fleetwood Mac in 1968. It was on "Black Magic Woman" where Campbell started to look comfortable. His guitar work on the track provided the type of moments fans didn't often hear on Tom Petty records. Campbell made his way across the stage during the track to interact with Christine McVie on keyboards. Mick Fleetwood stood up from his drum kit as the song came to a close, grinning ear to ear as he pointed a drumstick directly at Campbell. That moment was one of many which revealed just how much fun the members of Fleetwood Mac seem to be having at the moment, not necessarily a given during past Fleetwood Mac outings. Despite his absence, the group made no effort to shy away from Fleetwood Mac fare that's closely associated with Lindsey Buckingham. Finn handled the lead vocal capably on "Second Hand News" early in the set, teaming up with Campbell later for the guitar heroics that characterize "Go Your Own Way." These are polarizing times for Fleetwood Mac fans, as evidenced by fan reaction on social media to Lindsey's departure, the current tour and newly updated setlist. On one hand, fans who approach the group nostalgically miss the guitarist, while others are happy for a fresh take on vital songs the group ignored for decades. One thing that can't be argued is that the addition of Campbell and Finn seem to have injected new life into Fleetwood Mac. While it remains to be seen if that carries over to the studio, fans who can approach this lineup with an open mind will be vastly rewarded in the live concert setting. While it's strange to see Fleetwood Mac covering, say, Crowded House, it's rewarding to see a band willing to shake things up and try something different this far in, even if that means ignoring the nostalgia for a change.